The I-94 Modernization Advanced Bridges Project Team within the Michigan Department of Transportation recently received the 2018 MDOT-ACEC Partnership Charter Award that recognizes project managers and firms in Michigan for project partnerships based on trust, effective communication, continuous improvement, innovation and timely issue resolution. The award program, now in its sixth year, is sponsored by the Michigan DOT and the American Council of Engineering Companies. 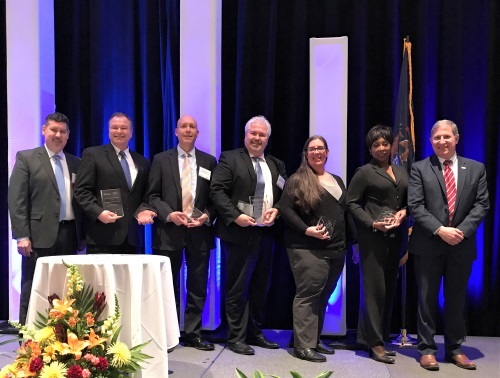 The I-94 team – comprised of professionals from Michigan DOT and private construction firm HNTB – took home the award for their “close work” modernizing seven miles of freeway in Detroit, reconstructing interchanges, upgrading nearby streets and replacing almost 70 bridges. He added that an MDOT/ACEC committee selected the winning team from a pool of six nominations.